While infrastructure investments can be crucial for economic development, large infrastructure projects, either financed with public or private money, can sometimes be costly for the public purse, leading to unsustainable debt and consume large resources which then are missing for other needs. Furthermore, in the public discussion, the risks of private involvement in infrastructure projects is increasingly being discussed, such as when the true size of debt is being concealed through Public-Private-Partnerships. But how to reach transparency on all investments, and to focus on the right infrastructure projects? And what is the role of international development banks like the German KfW? These and other questions shall be discussed. 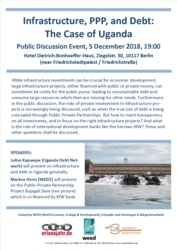 Julius Kapwepe (Uganda Debt Network) will present on infrastructure and debt in Uganda generally. Markus Henn (WEED) will present on the Public-Private Partnership Project Bujagali Dam (see picture) which is co-financed by KfW bank.